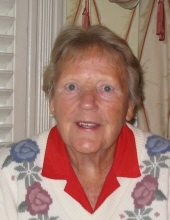 Bridget Elizabeth Quinn, of Carlisle MA, passed away peacefully at home on March 11, 2019. Born in Kiltultogue, Roscommon, Ireland on August 25, 1924, to Patrick and Elsie Lynch, Bridie was one of 13 children. She left her family farm at the age of 18 to move to England to study nursing. While there she experienced the tumult of WWII and the bombing of London. Along with two sisters, she ventured forth to Canada where she worked as a nurse in St. Catherine’s, Ontario. There Bridie met and married the love of her life, Peter, and they eventually relocated to Rochester NY where they raised their 6 children. In 1975 they moved to Tampa FL where Bridie lived until 2016 when she moved to Carlisle to live with the family of her daughter Sally. Bridie was wholly committed to her children and the true definition of what a mother should be. She was fondly called "Mom", even by those outside of the family. Her quick Irish wit and funny one-liners will always be remembered and cherished. Bridie was predeceased by her beloved husband, Peter Quinn. She was the devoted mother of Robert (and Carol) Quinn, Brendan (and Joan) Quinn, Maureen Quinn, Kevin (and Marianne, predeceased) Quinn, Sally Quinn Reed (and John Reed), Eleanor (and Dale) Finkbeiner. She was the loving grandmother of Cindy (and Michael) Cottorone, Bridget (and Joe) Petramale, Ashley Risso, Briana Risso, David Reed, Connor Quinn, Alanna Quinn and was predeceased by her grandson Kevin Finkbeiner. She was a loving great grandmother to Elizabeth Petramale. Her surviving siblings are Julia Griffin of London and Bart Lynch of Ireland. She was predeceased by her siblings Sarah O’Brien of New York, Maureen Gallaway of Fort Lauderdale, Eileen McGillicuddy of Uxbridge MA, Tim Lynch of Toronto, Nancy Hourihan of London, and five of her brothers (Patrick, Jack, Kevin, Brendan and Andy Lynch, all from Ireland). She had many loving nieces and nephews across the globe. Bridie’s nephew, Rev. Sean McGillicuddy, will officiate at her Funeral Mass. Her funeral will be held on Saturday April 27th at 1 PM at St. Irene’s Church, 181 East Street, in Carlisle. Memorial donations can be made to support the mission work of Bridie’s nephew, Rev. Patrick McGillicuddy, in Projeto Perpetuo Socorro, a school for underprivileged youth in Brazil. To be assured gifts will safely and reliably arrive to the school, donations can be made payable to the “Redemptorists” and sent to Rev. Sean McGillicuddy, C.Ss.R., Most Holy Redeemer Parish, 173 East 3rd Street, New York, NY 10009-7498. "Email Address" would like to share the life celebration of Bridget Elizabeth Quinn. Click on the "link" to go to share a favorite memory or leave a condolence message for the family.